Here is a list of Famous Museums in India which will help you in exams like UPSC, BPSC,SSC MTS.SSC CHSL, SSC CGL,Railways and other Banking Exams like IBPS, RBI, SBI Clerk etc. National Museum is located on Janpath, New Delhi. The National Museum is the largest museum in India. It holds variety of articles ranging from pre-historic era to modern works of art. The impressive building of National Museum is the houses of curious artifacts of the Indus Valley Civilisation and the Mughal era. 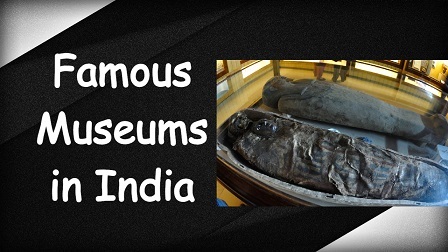 the most famous museums in India and The ninth oldest regular museum of the world. The Great museum included history of the building and details of art collection. Kolkata is a land of Museums. The 7 Wonders of Hyderabad include Salar Jung Museum,which has an exquisite collection of priceless articles like Ivory, Marble sculptures. Salar Jung Museum is popular as largest one-man collections Of the World, it is situated on the southern bank of the river Musi. This famous museum in India focuses on the rail heritage of India. It has the specimens of different evolution phases from the Indian Rail history. This is one of the finest textile museums in the world, Situated in one of the most beautifully, intricately wooden-carved Haveli. The Calico Textile Museum is the premier textile museum of the country and is the world’s best museum on textiles. Top museum in India to make it to a child’s list of museums in India . India is a land of dolls. They are used as idols, props for stories, toys, and for a number of cultural purposes. The museum is home to a stunning variety of displays from across south India. Special emphasis, however, is on the wood, bronze, and ivory carvings and artefacts from Kerala. Hindustan Aeronautics Limited (HAL) to showcase the aviation history and developments across the years. The museum has a wonderful display of models of aero engines. This one of the best museums in India has an extensive collection of fossils and skeletons of prehistoric animals. One of the best archeological museums in India, this one is dedicated to older civilizations of India. This famous museum in India is dedicated to children and their love for toys. Were you aware that India has its own version of Madame Tussauds Museum?